Spring is blooming. I snapped these two photos today of the first spring wildflowers I've spotted. Above is a Trout Lily. I just love these little flowers. I think their leaves are even cooler than the flower. 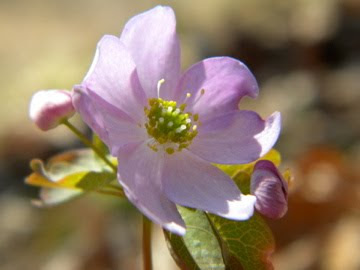 Earlier this week people began to see Rue Anemone blooming along the trails and I was finally able to get out and see it. Here it is below. The delicate flowers eventually fade to white. I took these photos with the new cameras we got for my digital nature photography summer camp I teach. I think they will work well. Woodland wildflowers are a passing friend in the year. They bloom early before the leaves come out on the trees and then fade away. It is a wonderful example of evolution in action. I also saw the beginnings of cranesbill a.k.a. wild geranium on the trails and it should be blooming before long. The magnolia in my yard is about to bloom as well. Maybe tomorrow or this weekend. The flowers have already started to open. Welcome to spring!